We have another Cultural Tour to the Himalayas and seeing that this trip will be amazing, absolutely a breathtaking itinerary…it has been put together with a great deal of love from me and my connection to those mountains. As the days go by, I will continue to update information I find along with pictures, memories and tales from the past few trips to the Hims! Beloved King Jigme Khesar Namgyel Wangchuck, was officially crowned on 6 November 2008. The Fifth King is an Oxford-educated bachelor, and the world’s youngest reigning monarch. 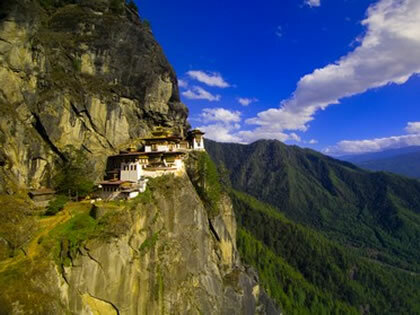 Bhutan is also the world’s youngest democracy: beginning parliamentary elections in 2008. King Wangchuck vows to maintain “Gross National Happiness” a measurement of national progress that places a high value on spiritual development. Gross National Happiness is a term invented by Jigme Singye Wangchuck, who opened up Bhutan to modernization. He used the phrase in 1972 signaling a commitment to build an economy that would serve and preserve the unique Bhutanese culture and Buddhist values.